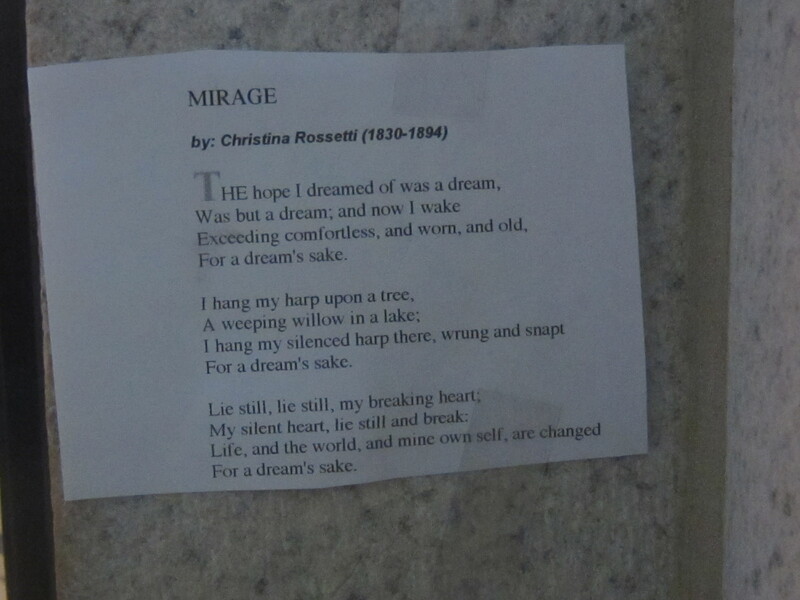 The best place for Christina Rossetti’s poem “Mirage” would be in the opening credits of Inception II. That is, if you’re in the camp that believes Leonardo DiCaprio’s character was still dreaming at the end of the original movie. Inception is about the only place where this poem wouldn’t serve as a gloating over another person’s suffering. Hidden in a gift shop’s Valentine’s Day display, The hope I dreamed of was a dream,/Was but a dream would be a bad omen or painful reminder. Tucked in with graduation cards, it would mock the relentless urging to follow dreams. The college prep section of Barnes and Noble, the cast list for a high school play or a dressing room mirror during bikini season would all be mean-spirited spots to leave this poem. 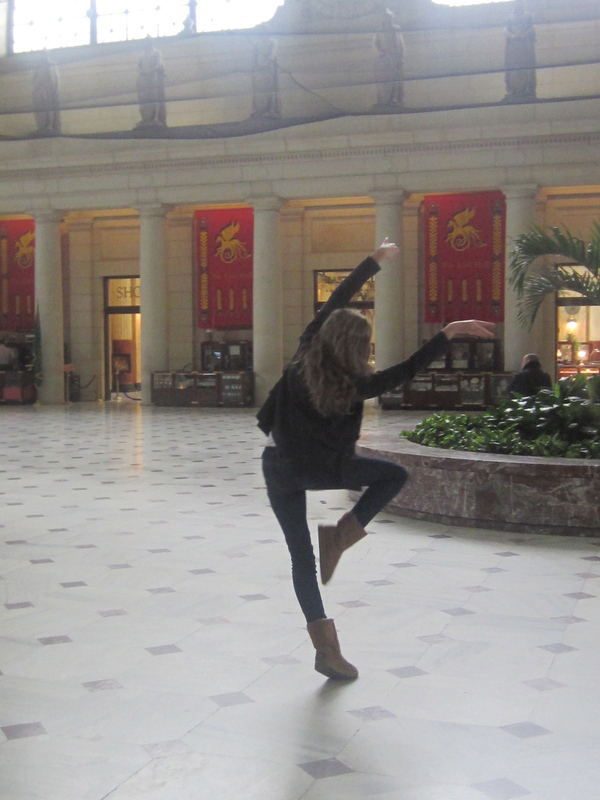 It seemed less unkind to leave it at Washington, D.C.’s Union Station. I do hope no Anna Karenina’s staggered nearby who might be driven to the train tracks by the poem’s despair. I left the poem as a diversion for train travelers, not a mirror, as a reminder that the train they just entered or exited can be a place of dramatic emotions, a scene of separation, the end of a romance. 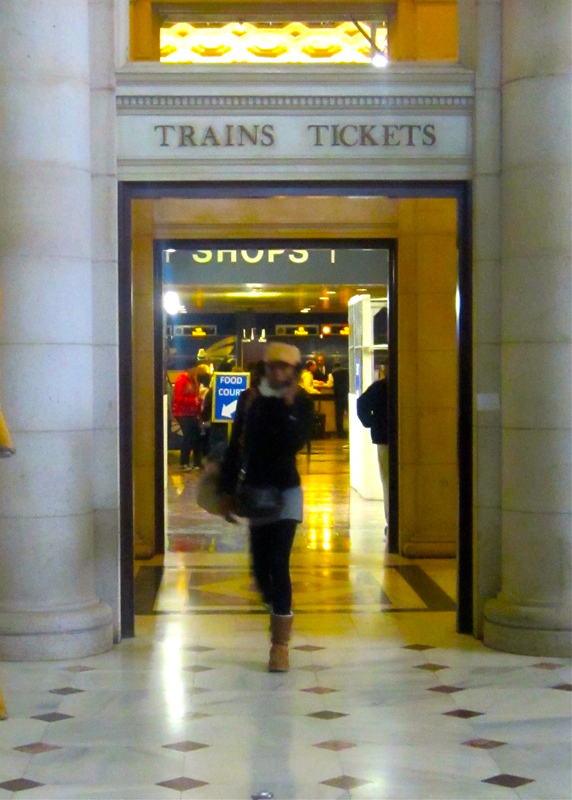 The D.C. station seems particularly appropriate for the poem because D.C., like L.A. and New York City, attracts some of the most ambitious dreamers in the country. Unlike those other cities, ambition in D.C. is often tied to idealism, a sure combination for the kind of bitter disappointment in the poem. The hope dreamed of in this poem is romantic, not professional and certainly not political. It speaks of a heartache I’ve never experienced. I myself am not one to bet the bank on a romantic dream. I like to think I have good judgment where men are concerned. But it’s true that I haven’t had many occasions to exercise said judgment. Perhaps I try not to want anything so badly that not getting it will crush me. Enlightened detachment or damage? An open question. At any rate, my instinct to detach makes me a terrible consoler for the broken-hearted, especially for one of my daughters who these days seems ever in the throes of romantic dreams. Many times I’ve mistakenly thought that if I could help her see she’s misreading signals or that a prospect isn’t worth her attention, I could prevent her from feeling exceeding comfortless. It hasn’t worked. In fact, my attempts at consolation have earned me the unfortunate nickname of “Dream Crusher.” Dream Crusher! my husband sings, Put on your boots and crush those dreams! Dream Crusher reads this poem and says, Get it together, girl! You don’t want to end up like Ophelia (drowned) or Miss Havisham (cobwebbed). And next time, sister, don’t pin all your hopes to a man. But the Poem Elf in me loves this poem. It’s gorgeous. It asks to be heard out loud, to be memorized, to be stashed away for gloomy days. My delight in the despair comes from the intricate way Rossetti uses tricks of sound to suggest more than is actually said. The rhyme scheme hinges on a single sound, “ake,” which if you didn’t notice can also be spelled “ache.” The harp, hung up on a tree and broken, carries a sound-suggestion of “heart” even before she mentions the word. “Lie still” she commands her heart, but the command echoes an accusation she may have thrown at the lover who betrayed her. The repetition in each verse becomes a keening: was a dream,/was but a dream, she wails, and we see her rocking back in forth in anguish. For all its sweet tones, the poem is violent. Hints of suicide lurk in the stanzas. The harp is wrung and snapt like a neck. It hangs from a tree. And the lake holds promise of a final silencing, a means to lie still forever. 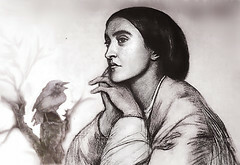 Christina Rossetti (1830- 1894) was born in London to an Italian family of high Romantic pedigree. Her father was a poet, her mother the sister of Byron’s friend and doctor, her brother Dante an artist and poet, and her two other siblings writers. She was a central player in the Pre-Raphaelite Brotherhood, serving as the model for several paintings and was certainly the strongest poet in the group. She lived with her mother her whole life and never married although she had plenty of suitors. As a very pious Anglican, Rossetti ended one engagement because her fiancé re-converted to Catholicism. She turned down two others for religious reasons. She died of breast cancer a few weeks after her 64th birthday. I have a t-shirt with one of her poems on it (from a sister’s weekend, see here) and you may have run across “When I Am Dead, My Dearest” searching for a funeral material. This animated video of her reciting that poem is really creepy, more suited to Halloween than the week before Valentine’s Day. Sorry, Dream Crusher insisted on posting the link.